Essie cashmere matte collection is beautiful and probably the most unique matte collection out to date. This matte formula was created from a semi-satin finish combined with reflective micro-pearls. 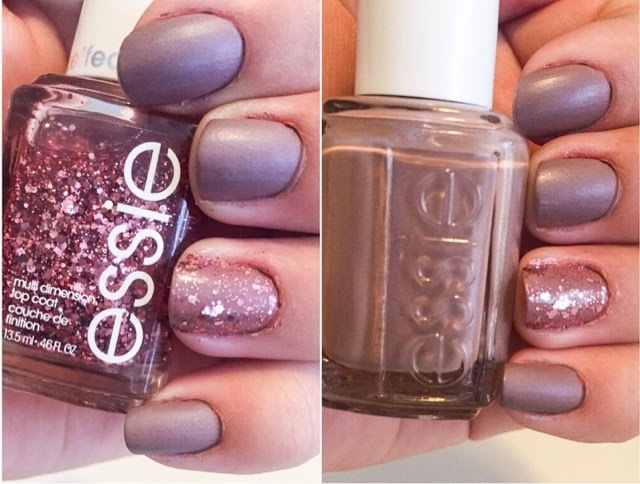 The Essie cashmere matte collection was inspired by luxurious neutrals and by rich cashmere texture. To achieve a beautiful matte finish, We found 2 coats is best and of course do not use a top coat to maintain the matte finish. The formula dries very quickly and applies effortless. The colours in this collection are such beautiful neutrals and have such a unique multi chrome finish to them that it's a new matte. DBP, Toluene and Formaldehyde free and available at your local drugstore and nail salons. Nails done with comfy in cashmere from the Essie cashmere collection with accent nail in a cut above from the luxeffects collection.